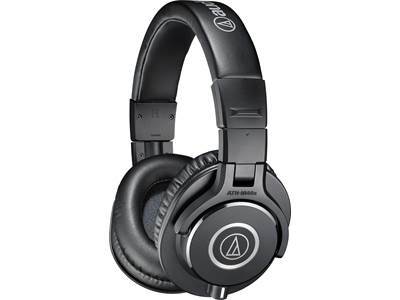 We don't see many over-the-ear headphones at this price point. 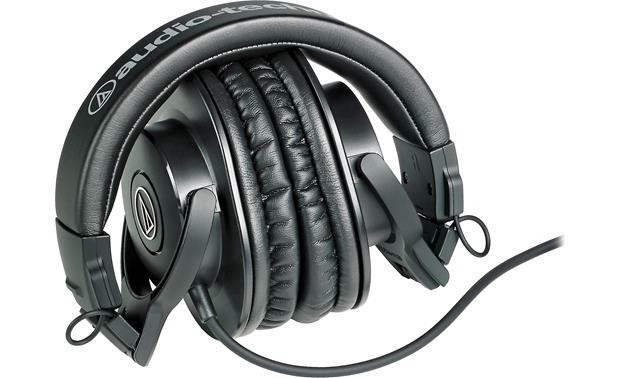 We don't see many over-the-ear headphones at this price point. 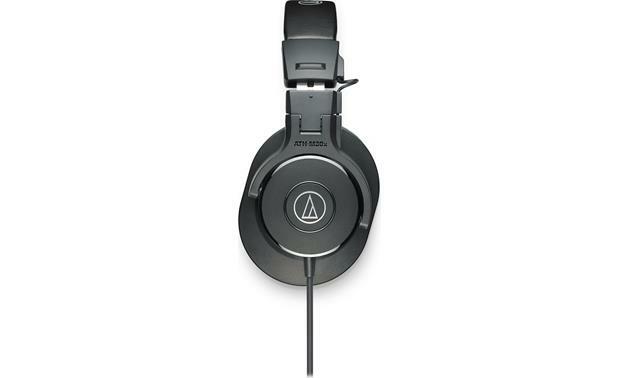 Of those, few sound as good as the Audio-Technica ATH-M30x headphones. With large 40mm drivers tuned to deliver fine detail with a particular emphasis on those crucial midrange frequencies, these 'phones are great for tracking and mixing vocals as well as guitars and keyboards. For everyday music listening, they'll give your music a nice fat sound that's well-balanced in the highs and lows. 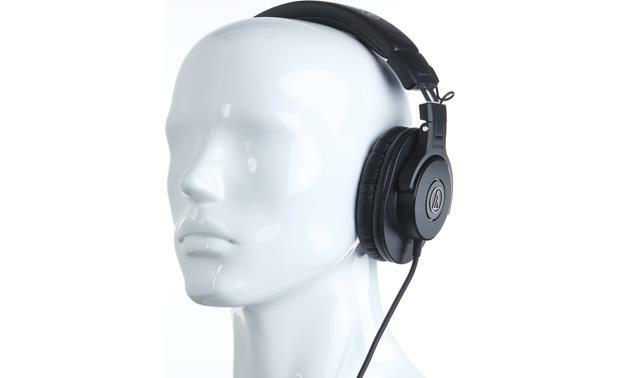 Thick padding on the earcups and headband offers comfort that doesn't disappear after just a couple of tracks. 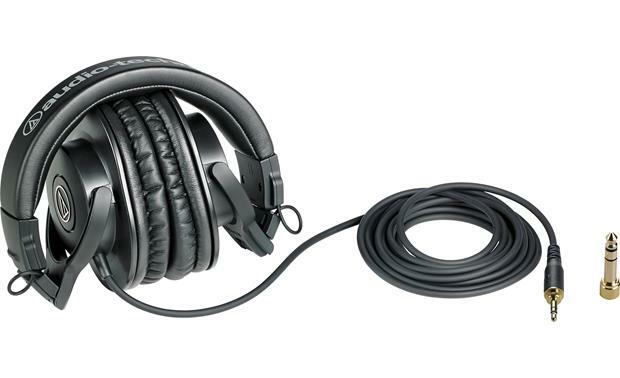 The 'M30x headphones feature an extra-long cable that connects to a single earcup, so you can easily maneuver in the studio. A 1/4" adapter is included for plugging into pro gear or your home stereo. 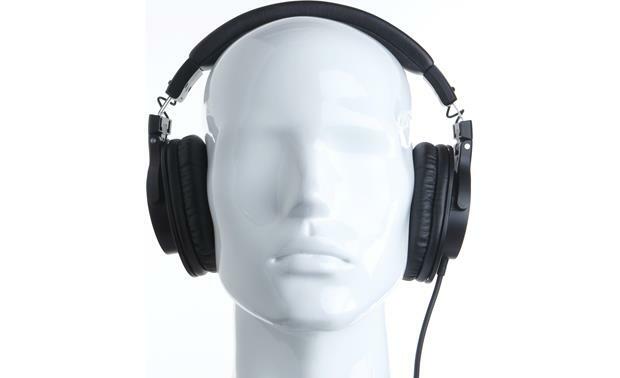 The earcups rotate and swivel, allowing for a great fit in addition to single-ear use for recording. 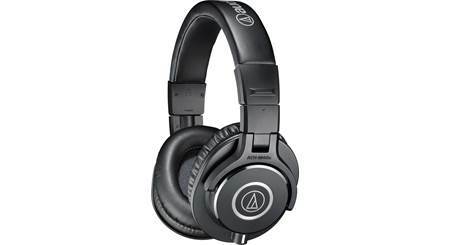 These headphones also collapse into a compact form factor so you can stow them in the included carry pouch. Very good headset unit. 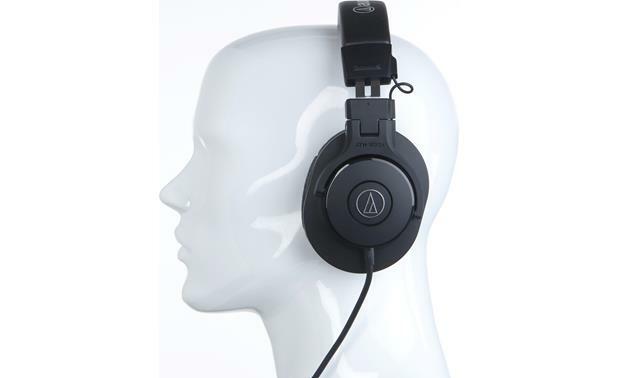 good response in the range of audible frequencies and good head room. Also quite comfortable. 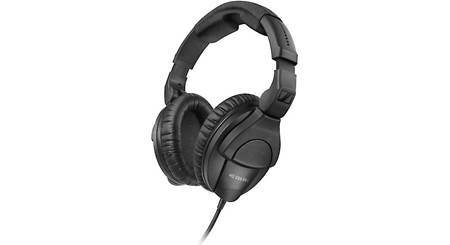 Does the Tascam THO2-B headphones work in iPhones? Overview: The Audio-Technica ATH-M30x Professional Monitor Headphones features a closed-back, over-the-ear design for excellent sound isolation in loud environments. 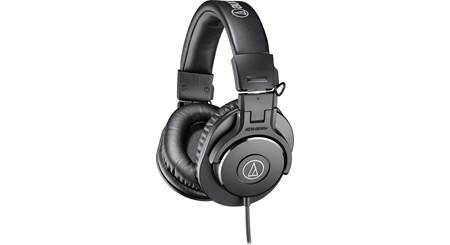 The sturdy ATH-M30x is designed for use for studio or field recording. 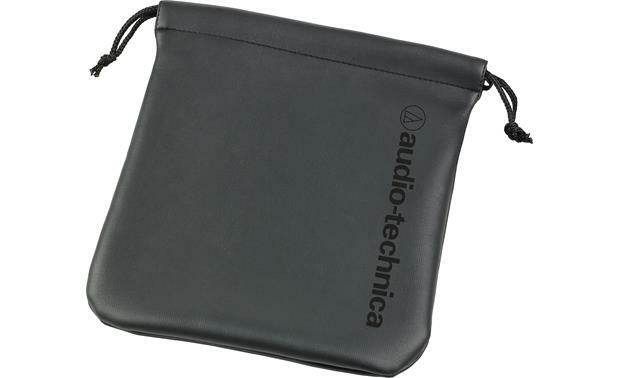 The ear cups fold inward for storage in the included vinyl storage pouch. Drivers: The 40mm drivers are made with rare earth magnets and copper-clad aluminum wire voice coils, and are tuned for enhanced detail and excellent midrange definition. 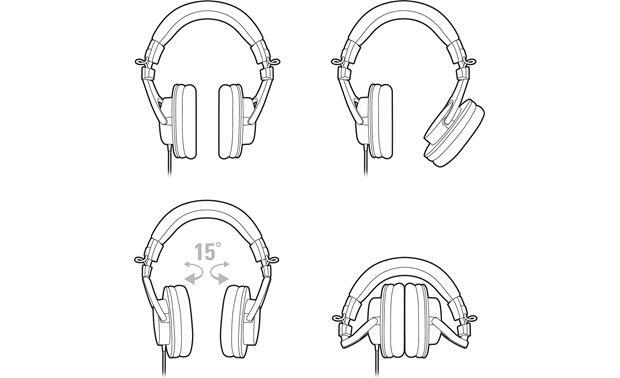 Cable: The ATH-M30x has a single cable exit on the left ear cup. The attached straight cable is over 10 feet in length (125"), and terminated with a 3.5mm mini plug that can be used with most portable devices. A screw-on 1/4" (6.3mm) adapter is included for those times when you're listening to home or professional components with a full-size headphone jack. I do not have an IPHONE but they work fine in my IPOD. I would assume they would work well in an IPHONE since the audio drivers are probably identical. 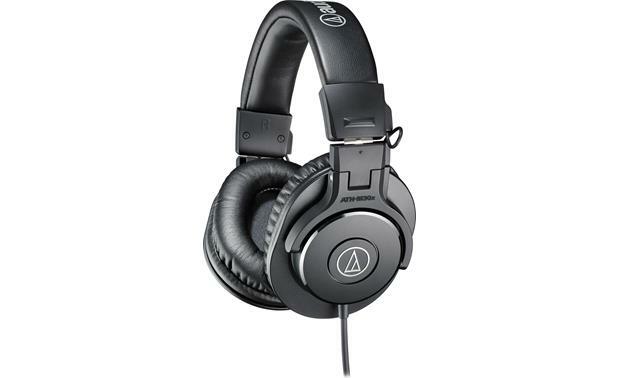 Searches related to the Audio-Technica ATH-M30x Professional monitor headphones.